It's been crazy busy for me lately -- and I'm happy about it! I've had a little time to do a few paintings, but mostly I've been busy with the ceramic pieces. I've even had to stop making them for the rest of this year, in fact. But they'll be back next year. The only ones I have in stock now on Etsy are the ones in the "Ceramics Ready to Ship" section. These aren't "picked-over" pieces but ones from the last couple of batches that I made that I finally got around to listing recently. 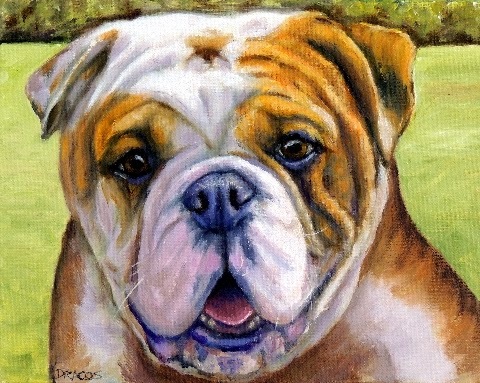 I've attached a pic of a recently finished (early December) English bulldog painting I did for a customer -- I took on a couple of custom paintings recently and may do a few next year, too, but only a few custom ones due to other commitments.